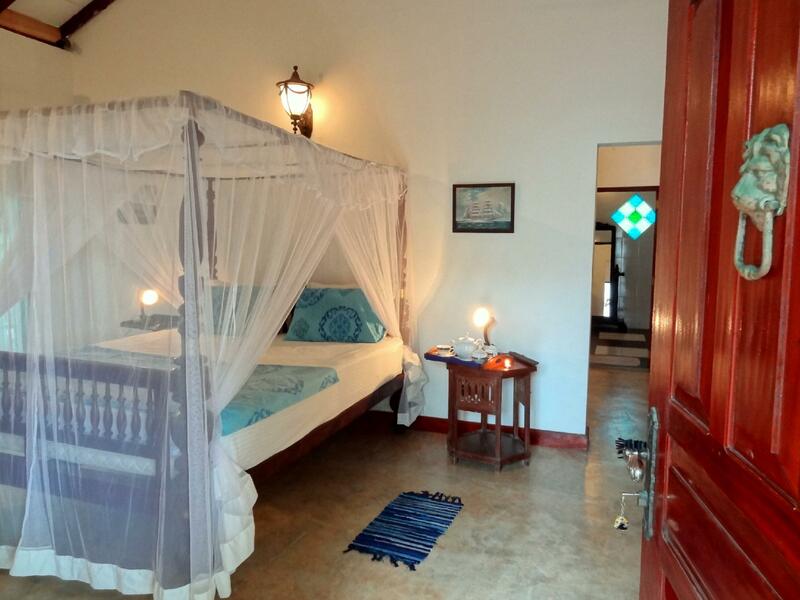 Heeft u een vraag voor French Lotus Unawatuna Guest House? Gelegen in Unawatuna strand is French Lotus Unawatuna Guest House de perfecte keuze voor reizigers die Unawatuna en omgeving willen bekijken. Het levendige stadscentrum is slechts 0.2 km verwijderd. Dankzij de praktische locatie liggen alle belangrijke trekpleisters in de buurt van het hotel. Profiteer van de ongeëvenaarde dienstverlening en voorzieningen in dit hotel in Unawatuna. Dit hotel beschikt over vele faciliteiten die zelfs de meest veeleisende gasten zullen overtuigen. Hotelkamers zijn zorgvuldig ingericht om het hoogste niveau van comfort te bereiken, met airconditioning, wekservice, bureau, balkon/terras, extra lange bedden (> 2 meter) in iedere kamer. Het hotel biedt geweldige recreatiemogelijkheden die uw verblijf onvergetelijk zullen maken, zoals tuin. Ontdek een boeiende mix van professionele dienstverlening en een breed scala aan faciliteiten in het French Lotus Unawatuna Guest House. Nice boutique hotel closeby the beach. Basic but nice room with everything you need. Great breakfast with homemade bread and jams. That was really good. Good vibe to chill! Only point to improve was the shower, that was not really working well. It should be a good hotel with beautiful environment. It feels strange about this hotel. The room was quite nice with romantic decoration and furniture. But the atmosphere is just completely different from all the Srilankan hotels we've stayed in for this trip. I guess it's because the hotel is managed by a french couple. They seemed to be quite nice. But they make this hotel different from the rest. I can't say if it is good or bad this way. Just in my opinion, it could have been better in a few ways. No complimentary bottled water provided. The breakfast was very late. You can only have it around 8:30. We wanted to have it earlier, but we couldn't find anybody to talk to the night before. Actually, it feels like there is a lack of staff in the hotel. Maybe because it is the low season. 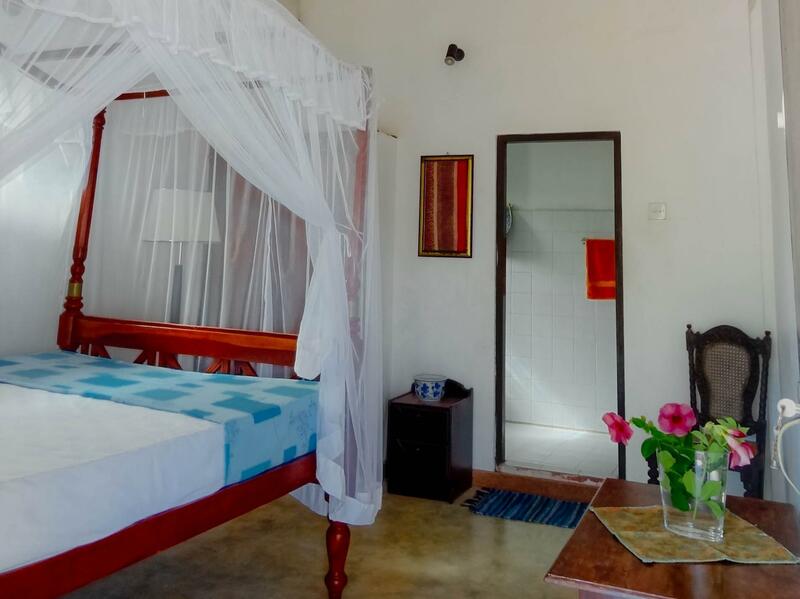 It was a great place in the green and near the beach, the staff was very friendly but unfortunately the rooms had openings to the exterior so the noises and lights at night were not stopped by anything making it difficult to sleep. 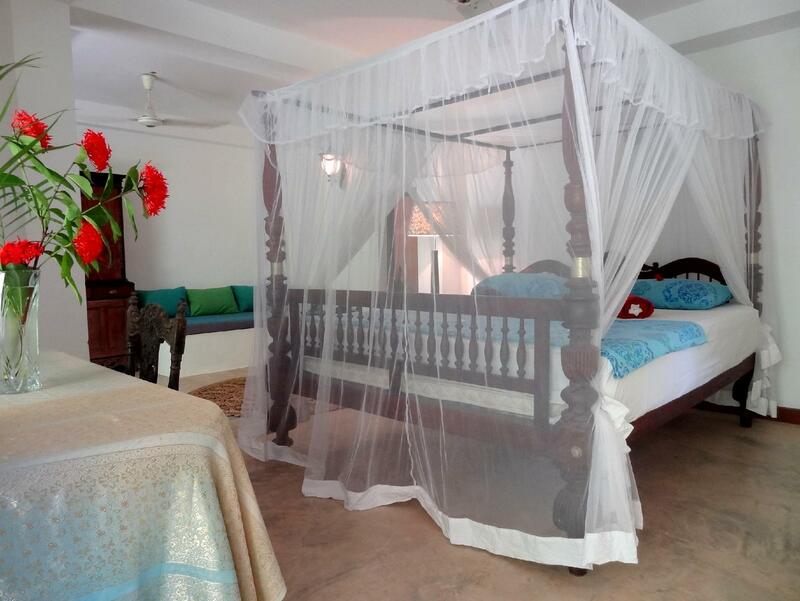 We stayed for almost a week at French Lotus guest house during our stay in Unawatuna. The guest house is operated by a French couple. They were extremely nice and helpful, and told us a lot of things about Sri Lanka and the region around. The guest house is quite new, was built around 2006 imitating British colonial style - red roof, white columns, curved wooden decorations. Very nice. You immediately feel yourself in a colonial atmosphere watching out from your terrace to the ocean and palm trees. The guest house has a big territory with many trees, flowers and a decorative lake with fishes. There is also a gardener working there to maintain all this. Every morning the entrance of our room and the room itself was decorated with flowers, everything was very clean and tidy every time. There are plenty of animals around - many many birds, chipmunks are coming just to your terrace, and often you can see monkeys and even varanuses around (however the guest house has a fence, so they don't come inside). The furniture of the guest house is the same style as the house itself - colonial style, with breathtaking wooden carvings. Comfortable beds, chairs and deck chair. The breakfast was also very good with freshly prepared mango, banana or pineapple juice, tea, coffee and baked bread with jam. It's quite close to the beach, ~7 minutes walking. Unawatuna has a very nice beach, is ranked among the 20 best beaches in the world. However there is an even better beach, which can be reached easily from French Lotus - the Jungle Beach of Unawatuna. You have to get there going opposite way on the road from the guest house, it's ~20 minutes walk through the jungle (but the road is good, so not a small forest-path. The beach is very very nice with many palm trees and pure sand. Always very calm. You can also see a Buddhist pagoda behind while swimming. There is also a beach restaurant, offering great quality food at very good, cheap prices. Stayed at French Lotus in January 2014 and had a great time. It is a little paradise among busy hotels and beach restaurants. The atmosphere is made by a French couple, who runs the property. If I came to this location again, I would definitely stay at French Lotus. It is wasting time and money to look for anything else than French Lotus. Wir waren drei Tage in diesem sehr schönen Haus im Kolonialstil, das von einem jungen französischen Paar geführt wird. Man konnte gut im Schatten der Veranden bei schöner französischer Musik entspannen. Am Wochenende gab es Beachparties, das war entsprechend laut zu hören, betrifft aber den ganzen Ort. Wir hätten gern eine Klimaanlage gehabt, weil sich die Räume tagsüber sehr aufheizten. Des votre arrivée, vos hôtes vous font un accueil à la hauteur des lieux. Cela ne s'arrête pas au 1er jour puisqu'ils ont toujours un moment pour échanger, une réponse à vos questions. La villa est très bien agencée avec un espace commun, une terrasse devant la chambre et un jardin agréable. Le petit déjeuner est délicieux. Séjour de 4 nuits qui s'est donc très bien passé. В Лотусе остановились на 10 дней после экскурсионки. Номер бронировали стандарт без кондиционера. Потолочного вентилятора было достаточно. Номер довольно маленький, но при учете, что мы там только ночевали, было достаточно. Кровать большая, удобная, белье чистое, за 10 дней поменяли 3 раза. Большим сюрпризом для нас стало открытое, решетчатое окно над кроватью и в душевой! Т.е. мало того что соседи, которые отдыхают на террасе (а там для этого предусмотрена вся мебель) все слышат, что происходит у вас в номере, но и при желании в душе, если вы стоите возле раковины (она на против окна) можно прекрасно все увидеть! Правда увидеть могут люди не маленького роста (у нас в соседях был как раз немец с ростом выше 170 см)))), для меня, человека с ростом 160 см, чужое лицо в окне стало не приятным сюрпризом. Наверное, для этого, в душе по середине стоит большой фикус вместо шторы)))) Завтраки для мужа были тоже не приятным сюрпризом. Фреш, чайник чая или кофе (на выбор), молоко, 6 кусков хлеба, масло и джем (только для 3 кусков хлеба!). Вообщем, отель принадлежит французам, поэтому завтрак тоже европейский. В остальном все очень понравилось. Владельцы очень приятные, всегда "шли на встречу" на наши просьбы. Очень приятная территория с прудиком и рыбками, а еще у них живет очень клевая собака.